90 minutes of beautiful ambient, dub, house and techno mixed in 1993 by Eli Star. This mixed tape is part of the “Atmospheres Collection”. Awesome mix! Love hearing Eli’s old tapes, always had such a dope galactic sound. Any Eli Star tapes are always a RARE find. Big Thanks for this one! Thanks for hosting the old mixes! I have links to some exclusive web only mixes I’ve made over the years that I would be happy to share with your visitors. I’m glad you enjoy the music! It’s my pleasure to host your old mixes. Thanks for the link to the additional mixes! Here are some more great old Eli Star tapes from the 90s. WOW! Big ups for the link synthetrix, Im digging all the mixes that you have there. 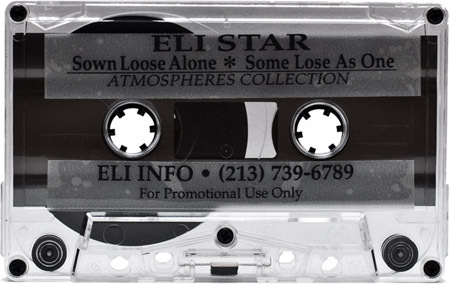 Cant believe all the eli star tapes you have, Im lovin all the rhythms! wow! 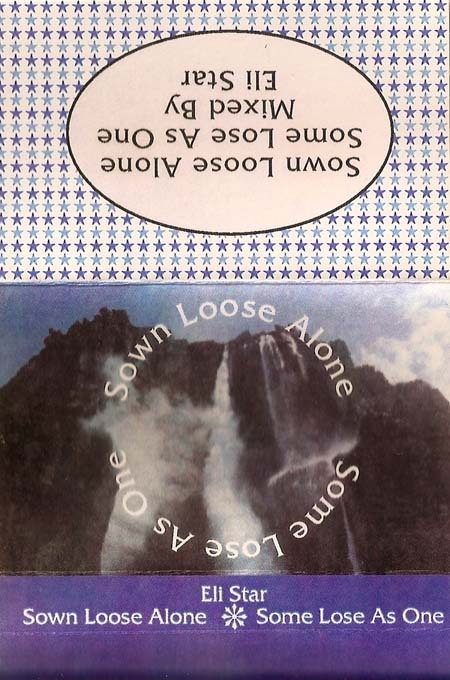 i had the”Sown LOse……” mixtape..and of course lost it somewhere…and thought, “I’ll never ever find it again”. Thank you so much for sharing! Do you have paypal. I would like to donate some cash to keep your site going. I had been searching for this tape since 1995. The first date me and my wife went on we spent listening to this tape in my crappy little apartment in east hollywood till 5am. We were both broke and in school at the time. It was a fond memory listening to this talking and eating chinese food. It was the night we had our first kiss. The rest is history. Thank you so much. Woah… Never thought I’d find these anywhere on the web. I’ve been a hunter of Eli Star mixetapes since Louis the IVX. Thank you Thank you Thank you for posting! good god… this is a revelation..
ah, and also…. OMEGA. god how i want that mix again…. I think we can help each other out. I can hook you up with Omega if you can give me a copy of Planitia Chryse / De-Kaying. Mine got eaten in a cassette deck. Head over to my website and email me a link and I will add Omega to my page of Eli tapes. It looks like Tef has posted “Omega”, but I have some other Eli mixtapes that you may be interested in. I have the “Whole Over” & “Grooves on Phobos” series mixed by Eli Star on cassette and cd form, if anyone is interested get a hold of me, much respect to Eli Star and all the fans on this site, the early 90’s scene was so magical, i have great memories of all the desert raves I went to see Eli spin at! Eli was one of my favs.. always good to chill to after a long night. I remember Eli spinning regularly at Sketch Pad in LA…. that was the perfect venue for his sets… Dark, mellow, chill. I have Eli Star – Landscape 52 if somebody could tell me how to get it from tape to digital…. Totally awesome tape! A definite classic! Would love to get some track IDs on this. Eli will always be one of the first Legendary underground LA DJs. The music he represented was full of intelligence, imagination, possibility and beauty. He made Ambient music relevant in the L.A. underground. Whats that first track on side A? Ethereal female sample, sounds like she’s singing “Videodrome.. nothing lasts forever..” over a wicked break. Love the contrast! Re-entry is already online. I can provide the link if anyone wants it. I would like the link sir!! tnx! Heather – if your tape is good condition you should click on the “CONTRIBUTE” tab on top of this page. Josh – here the link for now. I have a minty fresh copy of Re-Entry that I’ve already recorded. I’ll post it soon-ish. Other Eli tapes that are already recorded, but just not posted yet. Also some that I haven’t recorded yet…. Thanks Shahnam! Man….I would like to hear all those Jason. Is the “Live at Ambient Lounge” different than the one posted on Ezeskankin? Cool. I have all of his tapes except for Planitia Chryse / De-Kaying. That one gotten eaten by my tape deck years ago. Looking forward to that one. simfonik, thank you for an excellent site. Have you gotten a chance to post more Eli Star tapes? I have been converting tapes to digital since ’97. If I can be any help getting more tapes on here and offloading someof the work, please contact me. Again, thanks for a real jewel of a site and immortalizing these magical tapes of a bygone era. THank you so much for posting these! im glad to see there are still those out there who appreciate music that will never be this good again. I have been searching for these since 96′ as well, as I miss my box of cassettes the digital age has worked out really well when I come across these gems. Im still looking for my favorite all time ELi mixtape “Behind the Vinyl curtain” I think it was a red tape tape, I cannot find this for the life of me. Also Synthetrix said that “The Farm – Love See No Colour (3-Beat’s Stripped Down Mix)” https://www.discogs.com/Farm-Love-See-No-Colour/release/700553 is on here. But I’m not sure where.